Hi! 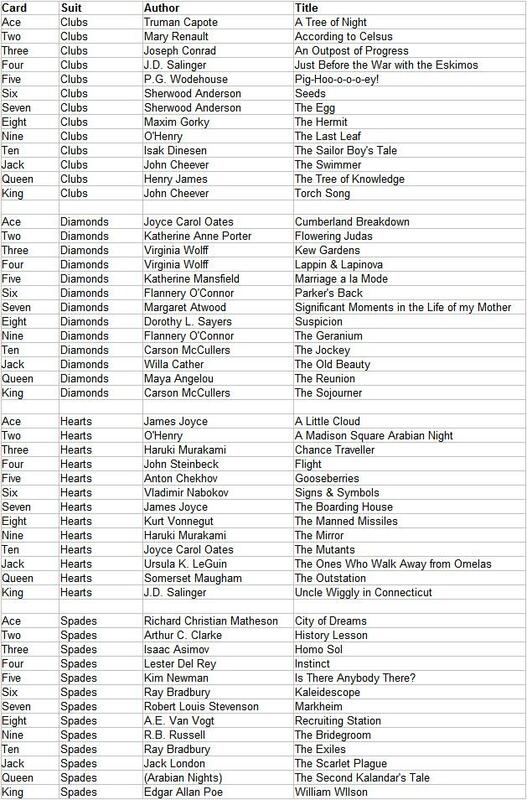 I’m going to read some of those diamonds and clubs. I did a post on O. Henry. His works are great. I will be reading more of his literary pieces. I’m now reading “A Passion in the Desert”. Thanks for visiting. I hope you enjoy A Passion in the Desert. It is one of my favorites that I’ve read in the past couple years. I have an old book of O’Henry’s short stories that is practically falling apart, but the ones I’ve scheduled to read this year are not among the ones I’ve read before. This is one of the coolest things ever! I am so impressed. Thanks, Nan! You should give it a try. The planning of putting a list together is almost more fun than the actual execution, ha ha. I’m already a story behind. I just realized too that I forgot to include “wild cards” this year (last year, deuces were wild and when I drew them from the deck I could read any story I wanted).